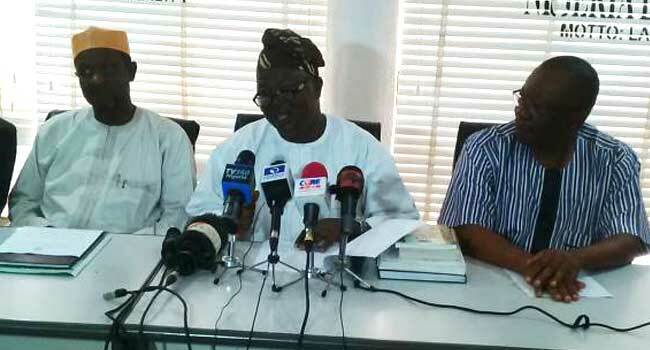 The leadership of the Academic Staff Union of Universities (ASUU) has suspended its nationwide industrial action. National President of the union, Professor Biodun Ogunyemi, announced this on Thursday during a press briefing at the Nigeria Labour Congress complex in Abuja. The striking lecturers took the decision after a meeting with representatives of the Federal Government led by the Minister of Labour and Employment, Senator Chris Ngige. The meeting came hours before Professor Ogunyemi announced the decision of ASUU to suspend the strike. It had in attendance leaders of the union and government representatives such as the permanent secretaries at the ministries of Education, as well as Labour and Employment, and some directors from the ministries. According to the ASUU President, the government has demonstrated a commitment by meeting some of their demands. He added that the government has signed a new agreement that would fast-track the revitalisation of universities, one of the critical demands of ASUU which led to the protracted industrial action. ASUU suspended its industrial action three months since the lecturers went on strike in early November 2018. The union went on strike following an emergency meeting of its leaders at the Federal University of Technology, Akure, the Ondo State capital. The lecturers had accused the government of failing to address its demands. They also raised concerns over the poor funding of Nigerian Universities, the alleged plot to increase students’ fees, introduction of an education bank, as well as non-implementation of previous agreements, among other issues. The government, on its part, said it was worried about the action of the union which has paralised academic activities in universities where ASUU has a presence across the country. This prompted the call by individuals and groups to the government to ensure the students return to school without any further delay. Meanwhile, the government has held several discussions with the union leaders, in its bid to end the industrial action. Signs of hope began to emerge on Friday last week following a meeting between the government and the union. The minister and the ASUU President had told reporters at the end of the meeting that they were making progress to address the issues raised by the striking lecturers. Although they did not give any specific detail, they had promised to address a press conference at the end of today’s meeting which resulted in the suspension of the strike. Friends and compatriots of the Press, On Sunday, 4th November, 2018, the Academic Staff Union of Universities (ASUU) resumed its strike action which was conditionally suspended on 14th September, 2017. The action of 2017 was suspended following the signing of a Memorandum of Action (MoA) in which the Federal Government of Nigeria (FGN) promised to address the contentious issues within a timeline that was to end in October 2017. While announcing the suspension of the nationwide action, however, our Union made it categorically clear that “ASUU will not hesitate to review its position should government renege on the signed Memorandum of Action”. Predictably, Government implemented the MoA in the breach, thereby forcing ASUU to resume the suspended strike action. Comrades and compatriots, as we have always argued, the last thing ASUU members love doing is to cause disruption in smooth intellectual engagements with colleagues, friends and students right on our university campuses. This has nothing to do with the dubious advertorial of “non-disruption of academic calendar” by proprietors and administrators of some cash-and-carry universities and other self-styled enemies of ASUU. Rather, it is about deep-seated pains members of the Union undergo to prevent strike actions and the equally painful consequences strike situations bring to all who are genuinely averse to the mercantile disposition to university education. Why Strike Action? The question has been asked time and time again: Why does ASUU like embarking on strike action that causes disruption and dislocation in the universities? However, ASUU is strongly convinced that if academics fail to fight the cause of university education, the fate that befell public primary and secondary schools would soon become the lot of the public university system in Nigeria. ASUU’s advocacy on the need to stem the continued slide into rot and decay in public universities since the 1980s has fallen on deaf ears. Our experience, as a trade union, shows that successive governments in Nigeria always entered into negotiated agreements only to placate those pleading the cause – be it education, health, transportation, employment or any other issue of meaningful living. This proclivity of the Nigerian ruling class, irrespective of which wing of the insensitive stock they belong, must be continually be tracked, engaged and resisted by all people of goodwill. ASUU ‘s action strike, which started on 4th November, 2018, was situated in the context of accumulated records of indifference and lackadaisical attitude of Government to negotiated agreements with the Union. – Reconstitution of the current Government Team to allow for a leader and Chairman of the FG-ASUU Renegotiating team who has the interest of the nation and the people at heart. – Release of the forensic audit report on Earned Academic allowances (EAA), offsetting the outstanding balance of the EAA and mainstreaming of same into the 2018 budget. In addition to the N20 billion for 2018, the sum of N25 billion only would be released in April/May 2019, after which government would resume full implementation of the MoU of 2013. Part-payment of the outstanding arrears of the earned academic allowances; defraying the balance up to 2018 in 4 tranches within 36 months; and mainstreaming further payments of EAA into the annual budgets beginning from 2019 budget. PICA verification and the release of the arrears of salary shortfall at the Federal University of Agriculture, Makurdi, not later than 15th February 2019. Strengthening the Consultative Committee on State-owned Universities (CCSOU), inaugurated on Monday, 28th January, 2019 to look into the issues of proliferation, underfunding and governance to consistently deliver on its mandate. Payment of the outstanding EAA arrears of all eligible staff in the University of Ilorin, especially the loyal ASUU members whose appointments were illegally terminated by today, 7th February, 2019. Acknowledgement and appreciation of Government for facilitating the release of the final letter of approval for the granting of operational license to NUPEMCO. Visitation to all Federal Universities would commence tentatively by 11th March, 2019. Provision of documented guidelines on procedures and roles of parties in the process of renegotiating FGN-ASUU Agreement of 2009 which would commence not later than 18th February 2019 and end by Friday 29th March 2019. Based on the initial proposals from Government, the Union made extensive consultations through its various organs. The final level of consultation was the meeting of the National Executive Council (NEC) which took place 6th-7th February 2019. NEC resolved that: Following a careful review of the report of engagements with the Federal Government on proposals for addressing all outstanding in the 2013 MoU and 2017 MoA, NEC resolved that the current strike action by the Union should be suspended conditionally with effect from 12.01 a.m on Friday 8th February 2019. However, should Government fail to fulfill its part of the agreement as reflected in the 2019 Memorandum of Action, ASUU shall resume its suspended strike action as the Union deems necessary. ASUU notes, with serious concern, the covert and overt roles of some vice-chancellors in the management and application of funds attracted by our Union to Nigeria’s public universities. Consequently, we condemn, in the strongest terms, Vice-Chancellors who have made efforts to undermine and, in some cases, attempted to break our patriotic struggles for the revitalisation of public universities in Nigeria. ASUU will not shy away from taking headlong those Vice-Chancellors who are reputed for acts of impunity, nepotism and other forms of conduct which are antithetic to university culture and the progressive development of our universities. Our union will compile all their shenanigans and forward them to relevant authorities for further action. Finally, ASUU acknowledges the understanding and support demonstrated by patriotic Nigerian students and their parents all through the strike period. We equally appreciate the comradely assistance from the Nigeria Labour Congress (NLC), represented by the newly re-elected President, Comrade Ayuba Waba, who has stood by us throughout the struggle. We also acknowledge the solidarity of the civil society organisations, especially the Joint Action Front (JAF) and the Education Rights Campaign (ERC), and members of the progressive wing of the media who have consistently partnered with us in our mission to rescue Nigerian public universities from imminent collapse. While we put a closure to this phase of the struggle, it is our hope and desire that the Nigerian governments (Federal and State) will play the roles expected of them in order to make the new Memorandum work. We shall never abandon our obligation to ensure the survival of a sound university system. For ASUU, the struggle certainly continues!